One person is reported dead, according to this VG article. The party of 13 that were attacked in their tent camp near the Von Post Glacier early this morning was british, and consisted of youths from British Schools Exploring Society. Several persons were injured when a polar bear attacked people near the Von Post Glacier approximately 40 kilometers from Longyearbyen. It has been a busy situation for ambulance personell at Longyearbyen, and assistance from the mainland was immediately sent northwards. This article on nrk.no first broke the news of the incident which was reported to the Sysselmann at Spitsbergen around 07:30 AM today, August 5th. The polar bear is now dead and health personell have arrived on site, the Sysselmann reports. “We have received four patients. All of them have moderate to serious injuries, mainly head injuries”, says Jon Mathisen, director of the department for acute medicine at the University Hospital in Tromsø to VG Nett. Liv Ødegaard, information consultant with the Sysselmann office, tells NRK that they don’t have a complete overview of the situation so far, including how seriously hurt the persons involved are. “We can now confirm that they were camping there, but if they were tourists or scientists is too early to say. At this stage we have made a priority of getting the injured persons medical help”, Ødegaard said earlier this morning. None of the involved people are identified so far, and the British department of foreign affairs does not have an overview of the situation yet. Starvation and lack of food is the most common motivation for a polar bear to attack people say Jon Aas, scientist at the Norwegian Polar Institute. “All polar bears are potentially dangerous, but there are higher numbers of young and starving bears involved in attacks”, Aas says. Kjersti Norås, tourism coordinator on Spitsbergen says that the Von Post Glacier is a common site for tourists to visit. “You can go there on snowmobiles in the winter to get to Pyramiden”, she informs VG Nett. It is recommended to carry guns when out in the field on Spitsbergen, and the company who met the bear have killed the animal themselves. Since 1971, four people have been hurt and four people killed by polar bears on Spitsbergen, Margrete Nilsdatter Skaktavl Keyser states in her master thesis on the subject. When situations with polar bears arise, the only solution is to kill the animal if possible, or else get killed. We should now ask ourselves: Is tourism on Spitsbergen OK? Perhaps travelling in these areas should be restricted to personell with real business in the area? Useful activities like science, hunting and industry? Perhaps we should keep tourists and adventurers off these pristine nature reserves? “Roald Amundsen – Lincoln Ellsworths flyveekspedisjon 1925” is a new DVD release of film footage from the nearly disastrous 1925 aeroplane expedition led by Norwegian polar hero Roald Amundsen. Financed by american businessman Lincoln Ellsworth, who also was a member of the expedition, the aeroplanes were registered as N24 and N25 and subsequently equipped for polar flights. They took off from King´s Bay in Svalbard on May 21st in an attempt to carry out the first transpolar flight of the North Pole, in order to establish once and for all whether there was in fact land in the area. After only eight hours in the air, engine trouble caused them to make an emergency landing at 87° 44′ north, in which the N24 was broken beyond repair. Trapped on the constantly moving ice, the crew of six did not know if they would survive. The film shows them struggling to make a temporary runway long enough for the remaining aeroplane to take off, which took them more than three weeks. It was the northernmost latitude reached by plane at that time. Shoveling over 600 tons of ice while consuming only 400 grams of daily food rations, the crew finally managed to take off in the N25 piloted by Hjalmar Riiser-Larsen, barely becoming airborne above the cracking ice. They managed to reach a fjord on the coast of Nordaustlandet at Svalbard before running out of fuel, making this one of the most exciting episodes in the history of aviation. The newly restored film is released by The Norwegian Film Institute and The National Library of Norway as a feature length documentary and has a new soundtrack by Matti Bye and Kristian Holmgren and a choice of norwegian, russian, german or english text. You can buy the DVD from the Norwegian Film Institute here. I have not seen this DVD yet, but several short clips have been featured in documentaries before. As an owner of a copy of the excellent release “Roald Amundsens South Pole Expedition 1910-1912” also by the Norwegian Film Institute, I am certain this release holds up to the same high technical and historical standard. The Russian company Trust Arktikugol has restarted coal mining at the archipelago of Svalbard after a two and a half year break. The production halt came after a fire in the local mine in 2008. Sea water was pumped into the mine to extinguish the fire, which subsequently destroyed equipment and required a major overhaul of production. Production restart was further complicated by low coal prices, NRK reports. In 2009, Svalbard had a population of 2,753, of which 423 were Russian and Ukrainian, Wikipedia informs. In Barentsburg, mining is the only livelihood, while the neighboring Norwegian settlement of Longyearbyen in addition to mining also has a well-developed tourist industry and a significant presence of polar researchers. Scientists at the Norwegian Polar Institute and the University Centre in Svalbard (UNIS) have investigated the amount of pesticides in the snow in Svalbard. Read about their findings here. How much dursban have you used to kill termites at your home in Longyearbyen? How much methyl parathion has been used to kill boll weevils on cotton plants in Ny-Ålesund? And how much endosulfan has been used to kill insects in apple orchards in Svea? While all of these questions are silly, the reality is that all of these and other pesticides are found in Svalbard. Some of them are found in high enough concentrations to suggest that there could be 1000 kg of each of them on all of the land ice in Svalbard. While insects are sometimes brought to Svalbard in cargo and, occasionally on strong winds from the south, the climate here is the most efficient pest killer that we have. So why are pesticides being found here? Since 2000, researchers from Environment Canada, the University of Pennsylvania (USA), the Norwegian Polar Institute in Tromsø, and now UNIS, have been asking the same question. These groups have collaborated on investigating pesticides in ice cores and snow pits from sites on Austfonna, Lomonosovfonna, and Holtedahlfonna, three of the major high-elevation ice fields in Svalbard. The most recent work, on an ice core drilled at Holtedahlfonna in 2005, included analysis of 64 different pesticides, some of them “legacy” pesticides that are no longer used, others “current-use” pesticides that are still being used somewhere in the world. [The legacy pesticides are no longer used because they are persistent in the environment and threaten non-pest organisms. The current-use pesticides are intended to have short lifetimes in the environment, often decomposing in air because of the energy effects of the sun. In darkness, however, that effect is nil.] Of these 64, there were insecticides, herbicides and fungicides. And of those 64, 21 were found in some part of the ice core. We should be happy that 43 pesticides were not found at all. But none of the other 21 were used in Svalbard, so, again, how did they get here? And why are they found in ice at high elevations? Europe and Asia or, in other words, from the south and east. They are deposited during snowfall or rain, or may change from gas to liquid in cold air. Fortunately, there is no indication that the amounts of pesticides being found are harmful to people or animals living on Svalbard. However, there is evidence that amounts of some pesticides in Svalbard are growing and need to be watched in the future. We are also finding that there are differences in amounts and numbers of pesticides reaching different parts of Svalbard. Austfonna, for example, received about twice as many different pesticides during the 1986 – 1998 period than found at Holtedahlfonna. Austfonna also had higher concentrations of most of the pesticides found at both sites. Analysis of air mass movements showed that air masses from Europe and northern Asia are more often flowing to Austfonna than to Holtedahlfonna, increasing the opportunities for pesticides to reach the northeastern part of Svalbard. Some of these pesticides that appear in Svalbard, if found in food or water in high concentrations, can be extremely harmful to mammals, including seals, polar bears and humans. The chemical agents in these pesticides do not distinguish between “pests” and “non-pests”. The chemical in dursban, known as “chlorpyrifos”, has the same toxic mechanism as chemical warfare agents like Sarin or VX , although at a very high dose. In other words, it is a poison that interferes with control of the nervous system which is how it kills pests. Endosulfan is thought to act like hormones in the human body, causing disruptions of some body functions. Other pesticides are considered to be carcinogens. The amounts of pesticides found in Svalbard can not possibly do any good. And the concentrations of some are increasing. So how can a Svalbard resident protect himself from the effects of pesticides? The best answer is the same used by people in other parts of the world, which is participation in a political process based on scientific facts. The “legacy” pesticides seen in Svalbard are nearly all declining in concentration because their use has been banned throughout the world by the Stockholm Convention (http://chm.pops.int/). This Convention is an on-going effort to eliminate contaminants, including pesticides, from the environment. The list of banned substances continues to grow, and with efforts from Svalbard citizens and scientists, could include more of the pesticides found in growing amounts in Svalbard. DNA extracted from a polar bear fossil found in Norway is giving scientists rare insight into the origin of the species, suggesting that polar bears may have evolved from brown bears in response to climate change in the past. “Our results confirm that the polar bear is an evolutionary young species that split off from brown bears some 150,000 years ago and evolved extremely rapidly,” said researcher Charlotte Lindqvist, from State University of New York at Buffalo. “Perhaps adapting to the opening of new habits and food sources in response to climate changes,” Lindqvist said. But the polar bears’ success in weathering temperature fluctuations over the past 150,000 years doesn’t necessarily mean the bears, like those living in Canada’s North, can make it through global warming today, the researchers said. Lindqvist explores the evolutionary origins of polar bears in a paper she co-authored with researchers from Penn State University and the University of Oslo, and published recently in the journal Proceedings of the National Academy of Sciences. 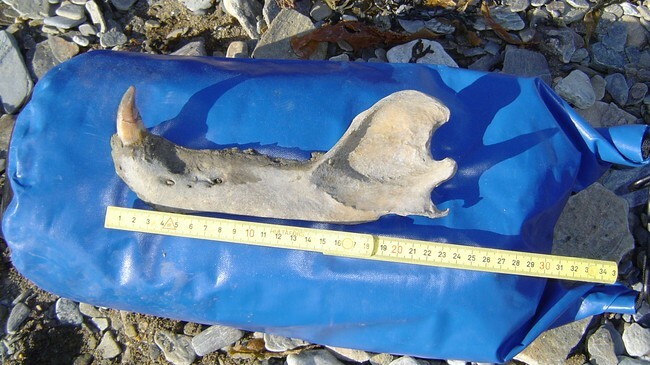 Polar bear fossils are rare, but in 2004, a geologist from Iceland found a fossil jawbone and canine tooth in the Svalbard archipelago of Norway, north of the mainland. After the find, Lindqvist drilled into the bone and tooth to extract powder that could be analyzed. Scientists then sequenced the mitochondrial DNA, which tends to reveal the most useful characteristics when examining the evolution of a species. Knowing the age of polar bears actually helps scientists better determine which major climate events they lived through, Schuster said. But it would be wrong to assume that because polar bears were resilient in the past, they are just as resilient now, Schuster said. Polar bears live their lives on the ice, so when they die, their remains often sink to the bottom of the ocean or are picked apart by scavengers. There are only two known polar bear fossils in the world, said Stephan Schuster, from Penn State’s Centre for Comparative Genomics and Bioinformatics, and only one contains any DNA. Many scientists believe that polar bears in Canada, and elsewhere in the world, are threatened by a loss of their sea ice habitat as a result of warming temperatures. There is significant concern that polar bears across the world will become “extirpated,” which means to disappear or retreat from a region, although continue to live in other areas. Andrew Derocher, a polar bear biologist at the University of Alberta in Edmonton, said some estimates peg the polar bear as being much older than 150,000 years. Some research indicates they have been around 700,000 years, or for even as long as one million years, he said. Nunatsiaq Online seem to be reporting on a story featured in the national broadcasting company of Norway, NRK. I dag er det 90 år siden Svalbardtraktaten ble undertegnet i Paris. Årene som har gått har bidratt til å styrke traktaten. – Traktaten har aldri stått så sterkt rent praktisk som den gjør nå. I havet utenfor er det fortsatt uavklart, bortsett fra fisket hvor det er forhandlet fram en ordning som fungerer i praksis. Skulle det bli funnet gass eller olje kan det bli kritisk, sier Geir Ulfstein, professor i offentlig rett ved Universitetet i Oslo. Ulfstein er spesialist på Svalbardtraktaten, som han har gjennomgått i avhandlingen: «The Svalbard Treaty: From Terra Nullius to Norwegian Sovereignty». – Slik det er i dag vil jeg fra et juridisk ståsted si at forholdene rundt traktaten er normalisert. I stortingsmeldingen som kom i fjor ble det riktignok vurdert om all lovgivning også skulle gjelde på Svalbard, og konkludert med at det skulle det ikke. I praksis gjelder likevel de fleste lovene, så på lovsiden er forholdene normalisert, sier Ulfstein. Assisterende direktør Arild Moe ved Fridtjof Nansens Institutt på Polhøgda i Oslo er enig i at traktaten står støtt etter 90 år. – En av årsakene til at det har gått greit er at virksomheten på Svalbard har vært begrenset. Det er klart at skulle det skje noe med mange interessenter involvert, så kan det bli stilt spørsmål om traktaten og bergverksordningen. Men så lenge det bare er nordmenn og russere som har økonomisk virksomhet der så fungerer det bra, sier Arild Moe. På lik linje med Ulfstein peker også Moe på at der hvor det er uenighet i dag er havområdene utenfor Svalbard. Svalbardtraktaten gjelder landområdene tilhørende svalbardøygruppen og tolv nautiske mil ut i havet. I rundt tjue år fra slutten av 1960-årene ble det gjennomført en rekke leteboringer etter olje og gass på Svalbard, uten resultat. – Hadde det blitt funnet noe ville verden sett annerledes ut, men heldigvis for traktaten har forholdene på Svalbard ikke endret seg så mye siden 1920. Allerede da dabbet aktiviteten av og siden har det vært rolig med få og tilbakeholdne aktører, sier Arild Moe. Svalbardtraktaten var også tema under det årlige Svalbardseminaret i Longyearbyen. Historiker Thor Bjørn Arlov hadde en historisk gjennomgang fra den spede begynnelsen rundt 1910 og de første forhandlingene om en traktat, fram til i dag. Assisterende sysselmann Lars Fause tok for seg dagens situasjon med blant annet den såkalte «helikoptersaken». Det russiske, statlige selskapet Trust Arktikugol, som driver Barentsburg, ble i fjor dømt i lagmannsretten for ulovlig helikopterflyging. Russerne påberopte seg Svalbardtraktaten og likebehandlingsretten, noe som ble tilbakevist i tingretten og helt utelatt i lagmannsretten. Fause tok spesielt for seg stridighetene i havområdene rundt øygruppen, hvor han har ført flere straffesaker mot russiske og andre utenlandske redere for ulovlig fiske. Svalbardtraktaten ble underskrevet 9. februar 1920 og trådte i kraft, ble ratifisert, 14. august 1925. Professor Geir Ulfstein er ikke bekymret for at traktaten vil bli utfordret i årene framover. – Man kan spekulere i framtidig kulldrift og inngripen i naturen, men akkurat nå ser jeg ikke de store problemene på land, sier han. Ulfstein merker økt interesse ute i verden for den spesielle traktaten, som er den eneste internasjonale avtalen etter fredskonferansen i 1920 som fortsatt består.